As a cook, I get such a rush from experimenting new ideas, techniques and flavors. There weren’t too many things I avoided trying except for aspics. When it came to risotto…it just seemed delicate and complex. It needs to be creamy, al dente not mushy, thick and porridge like but each grain distinct. Frankly, I found the dish a little intimidating….sort of like soufflé or skinny jeans. And while I may never conquer the skinny jean (let’s face it….not age appropriate), by following a few simple steps I was able to whip up a killer risotto on the first try! After cooking and eating it for a week straight I can say this with all certainty…it’s a cinch! A few ingredients, a couple of key steps and a bit of your undivided time and you’ll have a rich, creamy dish that’s versatile and elegant. Here’s a basic recipe along with a few suggested variations. Now get cooking! Heat a medium sized pot over medium heat. In a smaller saucepan, bring the stock to a simmer. NOTE: Using hot stock is KEY to making risotto so don’t skip this step. Dice the onion or shallot finely and mince the garlic. Heat the butter in the preheated pot. Add the onion and sauté until it starts to turn translucent. Toss in the garlic and sauté for another minute. Next, add the rice and stir to coat all the grains in the butter. Sauté the rice for 3 – 4 minutes. NOTE: This step is called ‘parching’ and does two key things. It gets the starches ready do their thing and ensures the grains stay whole but tender rather than disintegrating into a bowlful of mush. If you’re using the wine, add it to the rice now and stir until it’s been completely absorbed. Next, add 1 cup of the simmering stock to the rice. Stir, stir, stir and then stir some more. Keep stirring it until the rice has absorbed all the liquid. Repeat until you’ve added all the stock. This should take about 20 minutes. The dish should have the consistency of oatmeal/porridge and the rice should be al dente (cooked through but with a bit of texture). NOTE: Adding the stock 1 cup at a time and stirring creates that creamy texture so don’t rush this process. Show the rice a little undivided love and attention and you’ll be GREATLY rewarded! Stir in the cheese and you’re ready to eat! Top the dish with a bit of parm and some sautéed mushrooms….oh my yumminess! Try stirring in some peas and diced ham along with the parm for a complete meal. Add ½ cup of cooked, pureed butternut squash before you start adding the liquids. Amazing!! You could also use pumpkin, acorn or buttercup squash. BTW…tomato is also great! Beef and veggie stock work just as well as chicken stock. Not all rice is the same! Different rices have differing starch contents and textures but that’s for another blog. Stick to short grain, white rice for this dish. Regular long grain rice doesn’t produce quite the same result. Sorry Uncle Ben! Arborio rice is the standard for risotto (technically it is a medium grain rice). It’s also pricey. Try sushi rice instead. I get mine at the local Asian market for a great price. Any man who can make risotto is impressive. LOL! Why thank you! Hope you give it a try…it really is easy. I’ve tried before; it ended up undercooked. I hear ya. I sometimes have to add 1/2 cup more than the recipe calls for depending on the weather and altitude. The first time I changed up the recipe and added veggies, I subtracted liquid and wound up with a crunch mess. I love risotto! I make it often. Yours looks really yummy!!!! I love the addition of the sauteed mushorooms! Beautiful! Thank you!! The earthiness is a nice compliment to the park and the rich stock. Lovely! 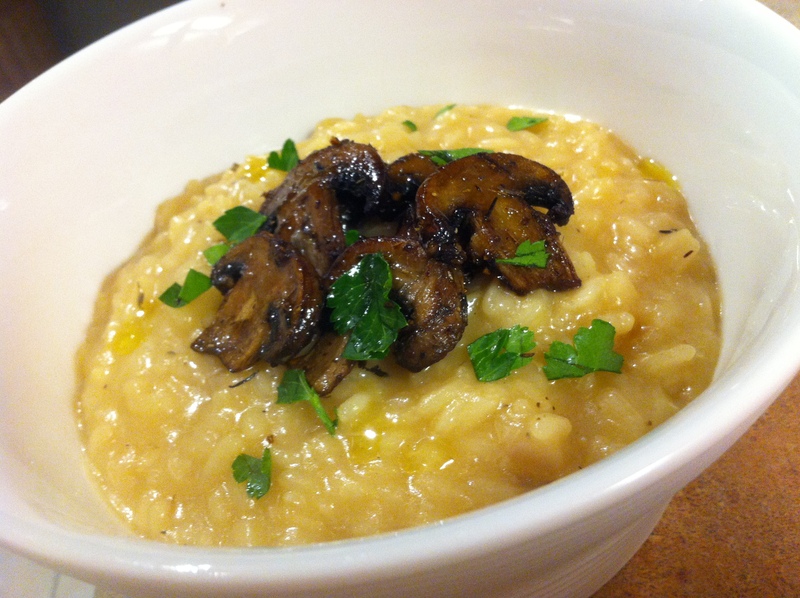 I’m making risotto tonight – I love it with wild mushrooms! Awesome!! What type of rice and mushrooms do you use? Thanks for looking at my Blog Aly. We live in a rice growing area here on the Ebre Delta and there are lots of different local Paella type rices (short grain) I have still to summon up the courage to do a taste testing experiment with the special ones.